In November of 2005 I took the first step on a scary but necessary journey to “find myself”. I just giggled as I wrote that sentence because how cliche is that? But I guess it wasn’t entirely cliche, since I usually think of early 20-somethings setting out on such journeys and I was nearing my 30’s but still knew very little about myself. I mean I knew facts about myself, but I had no real sense of who I was. The core of my personality, my likes and dislikes – even my goals in life – hinged on who I was with. I was a chameleon who didn’t know my own true colors. By the time December 31st of 2005 rolled around I was almost ready to take the next big step in my journey, which was to own up to the fact that I didn’t know what was best for me. As humbling as it was, the admission only made sense since I didn’t really know who I was. How could I possibly make wise decisions for myself? But it wasn’t until January 2, 2006 that I was ready to make this admission to anyone else. The funny thing is, is that even then I was in no way ready to admit how lost I was – how desperate I was for God. But God is patient and I am so grateful that His timing is perfect. He let me experience exactly what I needed in order for me to get to a place where I would not only recognize my spiritual bankruptcy for what it was, but where I could be humbled enough to cry out to Him. On this day, January 2nd, I celebrate the ten years I’ve been on this journey with God. The coolest part of my journey with Him may be that as I look back I can clearly see that He was walking with me long before I agreed to walk with Him. And I’m not just talking about the five months between January 2nd when I admitted I didn’t have it all together and the afternoon in May when I asked Him to be Lord of my life. I can look back over my life and see how He gently pursued me until I was ready to give Him all of me – my shame, my guilt, my fear, my insecurities, my hopes, my dreams, my identity. Over the last ten years He has guided me through a series of surrenders – some deeper than others, but all helping me to see Him for who He is. And in turn, who I am in Him. I share all this to encourage you wherever you may be on your journey with God. He is just and He is merciful. He will pursue you until you are ready to accept His grace and love. And once you have surrendered your all to Him, He will not leave you but continue to walk with you. I used to think that the phrase “Jack of all trades, but an ace of none” suited me perfectly. The truth is, though (sticking with the analogy) that I’m more the queen of starting many things but finishing few. I look around my house and see unfinished books. Lots of them. Logging into the dashboard of this blog shows more unfinished drafts than I care to count. I held on to the paper bunnies from our sons’ first daycare room just in case I ever get around to decorating it with things they liked when they started attending the daycare. In August. Of last year. That’s the story of my life. Great intentions but inconsistent follow through. When I get honest it comes down to a fear of failure. What if I fail at implementing all of the tips and life lessons an author shares with me? What if I pour my heart out in a blog post and it resonates with absolutely no one? What if I muster up all the craftiness I can and the family collage I create for the twins is an epic Pinterest fail? So my solution over the years has been to halfway do something. Either give a halfhearted effort by procrastinating to the point of having to rush to complete something or letting my interest in a project wane until I have an “Eh, oh well…” kind of attitude. Wanting to do life differently, I looked over my One Word for the past three years and prayed over my word for 2015. I joined the One Word party late in 2012. My word for that year was INTENTIONAL. I wanted to be more intentional with my time and more present with my husband and son. In 2013 my word was STEWARD. I prayed that God would help me be a better steward of everything He’s gifted me – especially my time, my body, and our home- and then expand my territory. But God has a serious sense of humor. He expanded my territory by blessing me with twins before helping me with managing my priorities. I guess He knows me better than I know myself and knew that I learn best when it’s a sink or swim scenario. I can’t remember what my word for 2014 was. I know it was a year marked by lots and lots of GRACE, though. After much reflection and prayer, God gave me FINISH as my word for 2015. Finish the assignments God has given me over the years but I pushed aside saying “There’s someone better for that, Lord.” Finish all of the books I started but put down. Finish the decluttering and organizing projects I’ve started over the years but walked away from when I felt too overwhelmed. Finish the small but meaningful projects I promised to do for friends but never got around to completing. I started out 2015 with the intention of finishing everything I started and even going through unfinished tasks and tackling those as well. But then I ran head first into the reason why I struggle with finishing in the first place. Fear of not completing a task perfectly. It’s not as though I wasn’t aware of this issue. I just naively thought that I could forge ahead with FINISH as my sword, when I really needed to allow God to attack the lie of perfection on my behalf with His grace. While I set out to finish reading books (my plan was to alternate between one I had started and put down with a new read) and projects around the house, God had other plans. He started performing surgery to remove the deeply imbedded lie of perfection from my heart, and showing me that I’m not alone. I’m not the only believer sidelined by a bruised ego, too afraid or weary to go another round with the unrealistic taskmaster that is perfection. 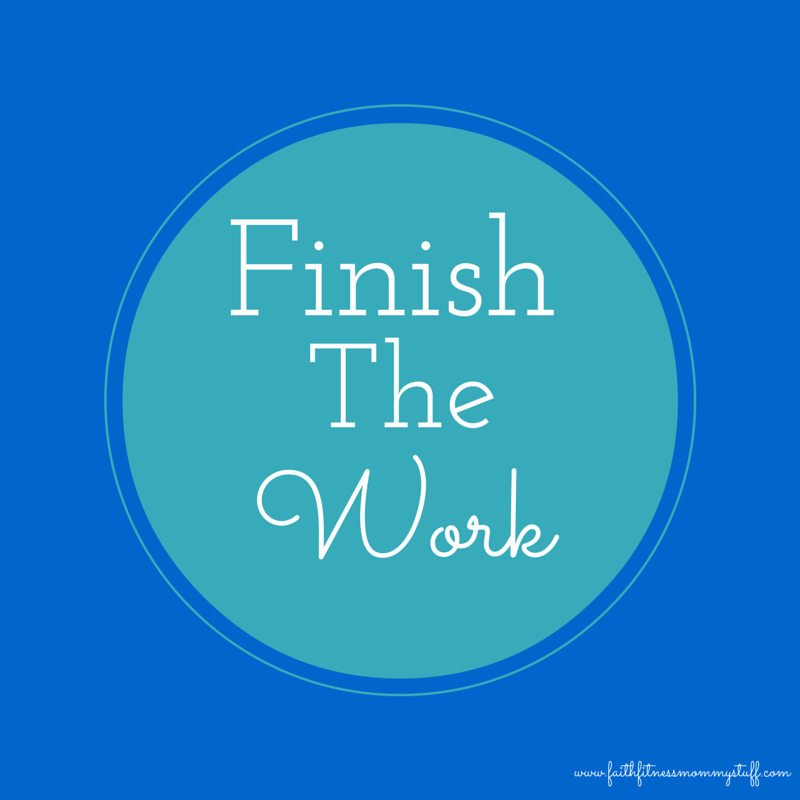 With God’s prodding and guidance, I started putting the Finish the Work challenge together. I knew it was going to be a social media campaign, so I didn’t really see the need to write anything out. But knowing recovering perfectionists the way I do, I knew that people would want something tangible to refer to as needed. It isn’t super complicated, but I created a PDF file so people wouldn’t have to search through blog posts to find it. Who am I kidding? I don’t post that much content. I wanted to share my #100DaysofFTW “to finish” list with you. It’s a comittment to spend at least 10 minutes a day (no more than 20) for 10 days on one thing. I spent way too much time on Canva creating the Finish the Work images and couldn’t decide which version I liked better so I decided to use both.